PUKALANI — The Kamehameha School Maui football team enjoyed its homecoming night on Friday at Kanaiaupuni Stadium. The Warriors beat Upcountry rival King Kekaulike 64-24 in front of a packed house. 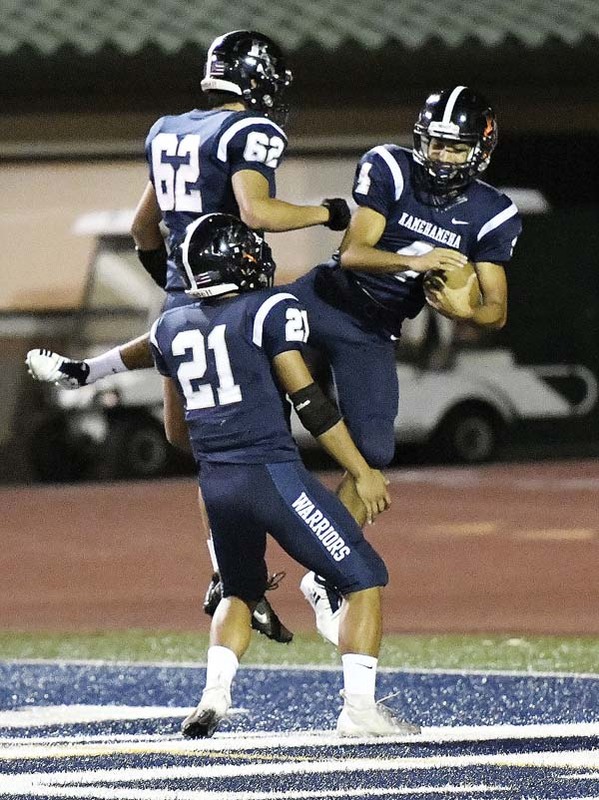 Kamehameha Maui improved to 4-3 in Maui Interscholastic League play, while King Kekaulike fell to 0-7. The game took nearly 3 hours to complete and featured seven touchdown passes by Kamehameha Maui sophomore quarterback Tiliti Adams, who finished with 217 yards passing. The first quarter took 51 minutes to play and featured six touchdowns, most of them of the quick-strike variety. The first half took an hour and 36 minutes to play and ended with the Warriors ahead 49-10 after Adams tossed five scoring passes. Karsyn Pupunu hauled in a 23-yard scoring pass from Adams just over 2 1/2 minutes into the game to make it 7-0. Adams then connected with C.J. Hamasaki for a 28-yard touchdown pass with 6:47 left in the first quarter to make it 14-0. Dane Abarra, who finished with 236 yards rushing on 14 carries, ripped off a 54-yard scoring run on the Warriors’ next possession to push the lead to 21-0. Just 16 seconds later, Kamehameha’s Tristan Catan ran 6 yards to the end zone after a fumble by Na Alii on the kickoff. Three plays later, King Kekaulike’s Trey Hunter ran 87 yards after nearly being caught for a sack to make it 28-7. Hunter finished with 198 yards on 28 carries. Abarra rushed 56 yards on the next play from scrimmage and Makani Smith-Kemfort caught a 2-yard scoring pass from Adams with 59 seconds left in the first quarter. After Hanalei Akina nailed a 26-yard field goal for Na Alii, Pupunu caught his second scoring pass — a 42-yard grab with 5:23 left in the second quarter — and Trystan Ah Yat hauled in a 13-yard touchdown catch with just under a minute to go in the quarter to activate the 35-point mercy-rule running clock to start the second half. Na Alii’s Elijah Finau turned off the running clock on the first play of the third quarter when he recovered a fumble on the opening kickoff and returned it 31 yards for a touchdown to close the gap to 49-17. The Warriors reactivated the running clock on the next possession after a 4-yard TD pass from Adams to Smith-Kemfort with 8:49 to go in the third. Hunter’s 14-yard run to the end zone with 1:09 left in the third quarter made it 56-24 to turn off the mercy-rule clock again. The Warriors put the mercy-rule clock back on for the duration of the game when Adams hit Pupunu for the third time on a scoring pass, this time from 3 yards out with 10:01 to play. Kamehameha Maui posted the highest scoring total of any MIL team this season while piling up 595 yards and 27 first downs. 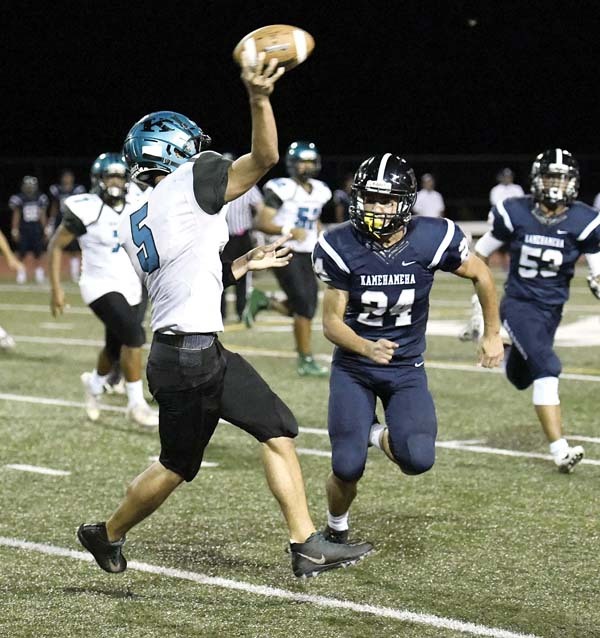 King Kekaulike finished with 236 yards of offense. KSM–Karsyn Pupunu 23 pass from Tiliti Adams (Sam Ostermiller kick), 9:25. KSM–C.J. Hamasaki 28 pass from Adams (Ostermiller kick), 6:47. KSM–Dane Abarra 54 run (Ostermiller kick), 3:05. KSM–Tristan Catan 6 run (Ostermiller kick), 2:49. KK–Trey Hunter 87 run (Peighton Akina kick), 1:42. KSM–Makani Smith-Kemfort 2 pass from Adams (Ostermiller kick), 0:59. KK–Hanalei Akia 26 FG, 9:01. KSM–Pupunu 42 pass from Adams (Ostermiller kick), 5:23. KSM–Trystan Ah Yat 13 pass from Adams (Ostermiller kick), 0:57. KK–Elijah Finau 31 fumble return (P. Akina kick), 11:44. KSM–Smith-Kemfort 4 pass from Adams (Ostermiller kick), 8:49. KK–Hunter 14 run (P. Akina kick), 1:09. KSM–Pupunu 3 pass from Adams (Abarra pass from Catan), 10:01. 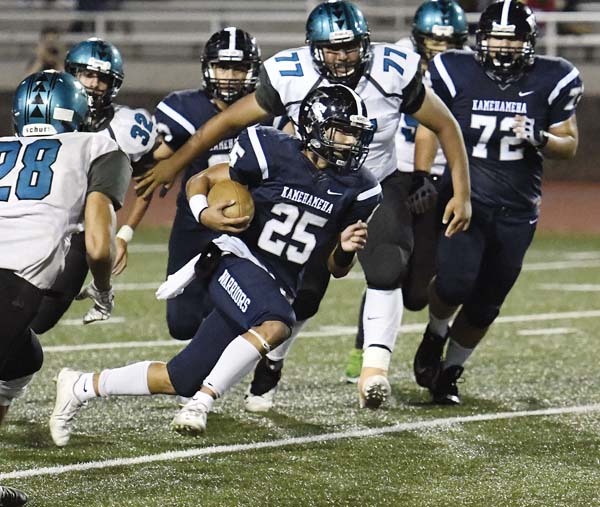 Junior varsity–Kamehameha Maui 42, King Kekaulike 7.